Our snackbars are available in different tastes and fillings and with various chocolate coatings. Of course we can develop a new bar just for you! Thsee bars can be made with two completely different layers on top of each other. The possiblities are endless with all kinds of ingredients like: nuts, raisins, superfruits, coconut or caramels. We have all kind of shapes and weights. 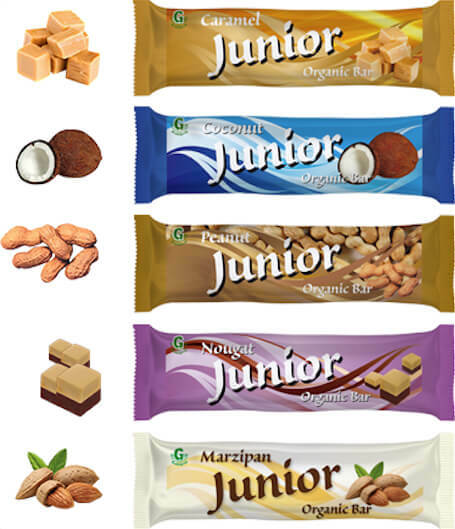 All these bars are Glutenfree and available in your own brand or in our brand: Junior. Let us know your idea about your bar and let's develop it together! If you would like more information please do not hesitate to contact us.